Be gentle -- tightly-spaced wires can cause discomfort for your pooch. If your pooch has curly hair or a double coat, the slicker brush is your best friend. It's designed to work on tough tangles and remove dead hair. Use the slicker brush with other grooming tools to keep your pet's coat healthy. Mist your pup's coat with conditioning spray. Never brush a dry coat because it can cause breakage. Light misting is enough. You don't want to soak the hair because it can cause mats or tangles to tighten. Brush your pup's coat from the surface to the end of the hair with the slicker brush. Be careful not to scrape the wires on the skin. You are working out the dead hair. If your pup has medium to long hair, lift the hair as you brush out toward the end of the hair. Remove the tangles and mats. If you hear a scraping sound when brushing, you have hit a mat or tangle. Try to remove the tangle with your fingers. If that doesn't work, use the outer teeth of a metal comb to work on the edges of the mat. Once you have loosened the mat, it’s time to use the slicker brush. Brush the mat in different directions with the slicker brush. This will help loosen the mat until you can brush through it. Be careful not to pull the hair. Continue to brush your pup to remove the dead hair. Work around the legs, body and neck. Don't use the slicker brush around the face. A bristle brush or pin brush is less likely to scratch the skin where there is little hair. The slicker brush is excellent for poodles and other curly-haired dogs because it helps straighten the hair. Choose a slicker brush for the size of your pup. There are small brushes for toy dogs and large brushes for larger pups. Don't attempt to cut out tight mats. Go to a groomer. 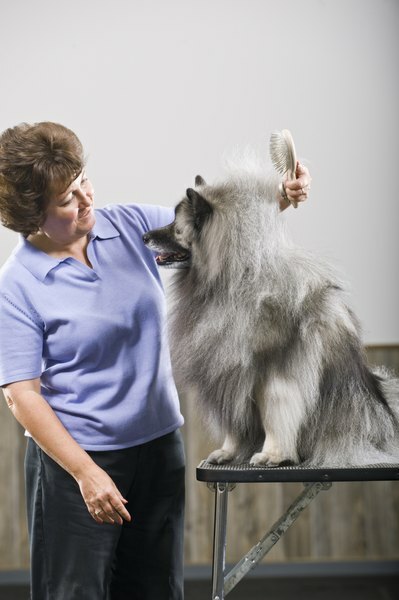 What Kind of Brush Do Dog Groomers Use?